Every year, Doritos has a Superbowl ad competition – contestants enter from all over the United States. The contest is down to it’s ten finalists – and one of them is from right here in Astoria. CNN Money covered the full story, and has an interview with Alex Pepper, the creator of “What Could Go Wrong?” an ad created for a more $80. “Alex Pepper, 25, is one of 10 finalists out of 4,900 contestants in PepsiCo’s annual “Doritos: Crash the Super Bowl” ad contest. For a brief spot called “What could go wrong?” he’s earned a minimum prize of $25,000 and a trip to the Super Bowl with his girlfriend Sarah Lynn Reedy, who shot the ad. They will be guests at a private suite watching the big game in the University of Phoenix Stadium on Feb. 1. Two ads from the 10 finalists will air during the game. The grand prize, selected by voters on the Doritos web site, grants the winner a $1 million jackpot plus a one-year “dream job” at Universal Pictures, according to PepsiCo, which owns the Doritos brand. The second prize winner, selected by PepsiCo, gets $50,000. Spoiler Alert: In the ad, a dancer is so revved up on Doritos chips that he picks up his partner for a beautiful aerial dance move. That’s when he slips on a Doritos bag and drops her off the rooftop, playing on the tagline of the spot: What could go wrong? 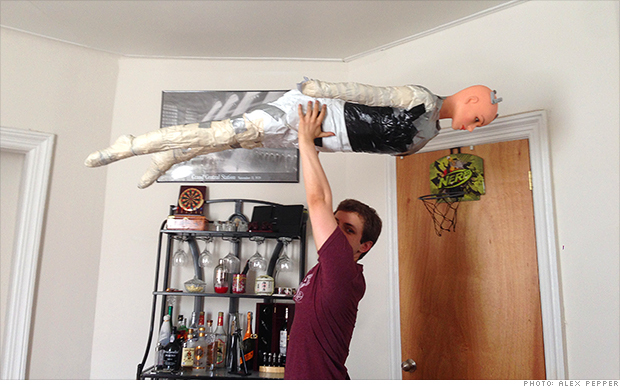 Pepper said he constructed a duct tape dummy, which was what he threw off the roof. He did fasten a rope to the dummy and reeled it back up after the filming. As a finalist, Pepper said he’s already made more than his total earnings from last year working as a theater actor and dancer. He said he’s appeared on “Law & Order” and “Saturday Night Live,” but only as a “moving set piece” without any lines. Pepper spent a total of $80 on the ad, which was shot with his Nikon D800 back in October. The set was the roof of his apartment building in Astoria, Queens. Pepper is the dancer who drops his partner, played by Morgana Phlaum, a friend’s girlfriend. Pepper’s own girlfriend filmed the scene. He submitted the ad and said he recently got a call from actress Elizabeth Banks of “The Hunger Games,” who told him he was a finalist. If he wins, Pepper will be providing creative input on movies like “Pitch Perfect 2,” which is directed by Banks. According to PepsiCo, Banks will also be with the winners at the University of Phoenix Stadium. We did ask if Pepper has ever actually dropped a dance partner.